COLOR(S): Black, dark reddish brown, or roan, with or without tan points. COLOR(S): Tri-colored. Black with tan markings and white flashings. The Bernese Mountain dog makes an exceptional friend for life. Sporting a striking tri-colored coat, these intelligent and agile dogs are sturdy, large and strong enough for draft and driving work. They were originally used in the mountainous regions of their native land for such difficult tasks. Male Bernese Mountain Dogs are masculine in appearance while females display distinct feminine characteristics. The large Bernese Mountain Dog has a playful nature and is often said to be slow to mature or maintain a puppy-like attitude for some while. These dogs are one-owner dogs who will be extremely loyal to their families and may find it difficult to adjust to a new master if introduced after 18 months of age. They are intelligent, easy to train, eager to please and very social. Their sweet, outgoing nature makes them affectionate and loving toward children. Additionally, they generally do well with other pets and make natural watchdogs who are not aggressive. With a beautifully striking, weather-resistant coat, the Bernese Mountain Dog should be regularly groomed. Their tri-color coat sports symmetrical rust and white markings amidst the jet black coloring. Their chest features a dash of white which is also mirrored on their head and toes. 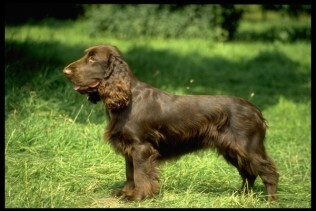 The double coat of this breed is marked with rust coloring over each eye, on their cheeks, under their tails, on the sides of their chest and on each leg. Since the Bernese Mountain Dog comes from a small genetic pool, there is the increased risk of health concerns and genetic disorders such as stillborn puppies. Other health issues include elbow and hip dysplasia, autoimmune diseases, hereditary eye diseases, cancers, kidney problems and aortic stenosis. In addition, Bernese Mountain Dogs may suffer from von Willebrand’s disease, coat and skin problems, and thyroid disorders. Due to their deep chests, they are particularly susceptible to bloat – the second largest killer of dogs other than cancer. While Bernese Mountain Dogs do require regular, daily exercise, they should not be taken on tiring, long walks until fully grown. Originally bred as herding dogs to protect their flocks and family, Bernese Mountain Dogs are smart, quick-learners. They need a consistent and loving approach to their training as well as socialization among other dogs and people.